The WOODSTOCK FILM FESTIVAL is set to announce the unveiling of its official 2016 poster this July at the Elena Zang Gallery, 3671 NY-212, Shady, NY. The event is free and open to the public. Date and time will be announced shortly. 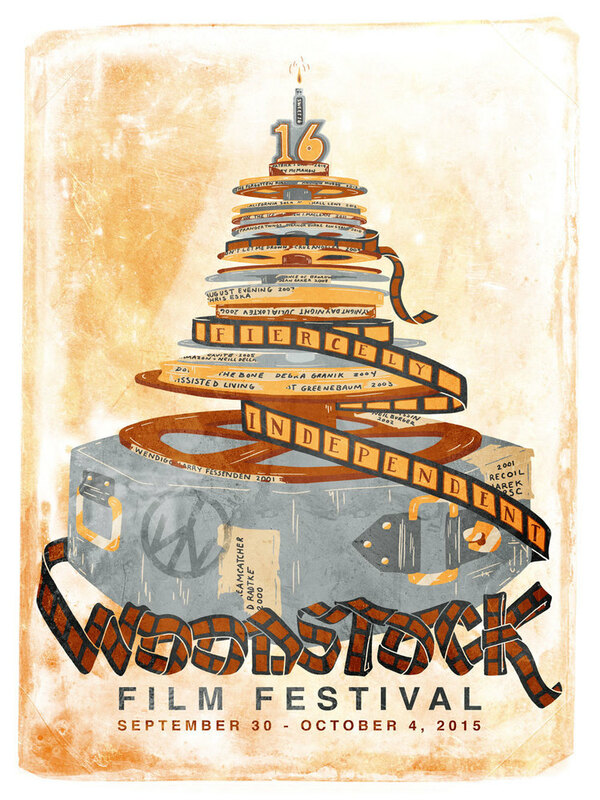 Past poster artists for the Woodstock Film Festival include Joy Buran and Noelle Melody (2015), Michael Dubois (2014), Scott Michael Ackerman (2013), Bill Miller (2012), Kathy Ruttenberg (2011), Portia Munson (2010), Milton Glaser (2009), Karen Whitman (2008), Peter Max (2007), and many others. Following the unveiling, signed limited edition prints and posters, as well as t-shirts, hats and commemorative merchandise will be available for purchase at THE FILM CENTER at 13 Rock City Road, Woodstock, NY or on the Woodstock Film Festival website. The Woodstock Film Festival proudly honored two local luminaries -- Ron Nyswaner and Philippe Petit -- at its SPIRIT OF WOODSTOCK CELEBRATION on June 4 in a beautiful estate overlooking the Ashokan Reservoir. The SPIRIT OF WOODSTOCK celebrates the roots of the Hudson Valley — its natural beauty, iconoclasts, art, culture, innovation, and the river that flows through and connects it. "Our heartfelt thanks go out to everyone who contributed to this very special event," stated Woodstock Film Festival co-founder and executive director Meira Blaustein. "What made this year’s Spirit of Woodstock celebration particularly magical was the nature of the honorees -- a world renowned tightrope walker and a first class screenwriter -- and the spectacular backdrop of the Ashokan Reservoir and the Catskill Mountains." "What a wonderful evening – such deserving honorees, great friends, perfect weather, and fabulous volunteers to make the event go off without a hitch." added Woodstock Film Festival board president Lauri Andretta, who introduced the event. Meira Blaustein then introduced actor Tim Guinee (Hell on Wheels), who delighted the crowd with a hilarious presentation to friend and mentor Philippe Petit. “Philippe is a great poet of the wire. He is an artist in the air and what he does is lift us up to be able to see our own possibilities as human beings," said Guinee. "He’s courageous enough to be the man who takes the first step out onto the wire of our communal possibility, and I am deeply honored to present a criminally insane, gloriously insane man… Ladies and gentlemen, Philippe Petit!” (listen to audio online). Petit accepted the honor with panache, humor, humility, and a movie quiz for those assembled. Actor / director and screenwriter Michael Cristofer adeptly pointed out how Ron Nyswaner has broken barriers with his screenplays, including A Soldier’s Girl. "Long before any of us knew the word 'transgender' or fumbled over pronouns or which bathrooms people should use, Ron Nyswaner wrote a brilliant script about a young man in love with a woman who was also a man,” said Cristofer. “That film told a beautiful human story and, through the miracle of cable TV, brought the issue into millions of American homes." Cristofer also pointed out that Nyswaner’s screenplay The Painted Veil was produced in Shanghai before the Chinese opened their doors to international filmmakers and that Philadelphia blew the doors off the aids epidemic and into our collective consciousness. Nyswaner’s heartfelt and eloquent acceptance speech was an homage to the region and its rich mix of people, singling out some of his own mentors, including the workman who invited him to spend Christmas Eve with his family one lonely holiday season, and former Spirit honoree, Congressman Maurice Hinchey. Nyswaner also took the opportunity to call on the assembled guests to join him in supporting the Woodstock Film Festival, especially its LGBT Focus. The evening was attended by many special guests including former David Bowie bass player Gail Ann Dorsey, composer Johan de Meij, sculptor John Kahn, and many others. 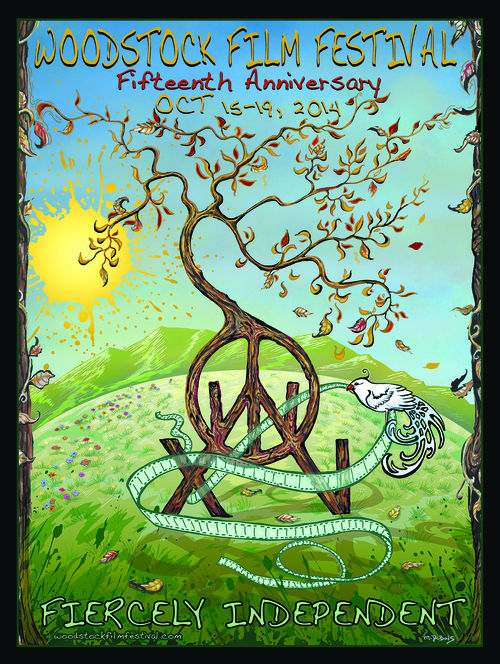 Previous SPIRIT OF WOODSTOCK honorees include Michael Lang, Congressman Maurice Hinchey, Mark Braunstein, and Levon Helm. The Spirit of Woodstock Award, is hand-crafted by local artisan Steve Heller of Fabulous Furniture. Click to read full release. Other awards include WORLD CINEMA AWARD, BEST ANIMATED SHORT, AUDIENCE AWARD for NARRATIVE & DOCUMENTARY FEATURES. The Woodstock Film Festival is honored to have Blackmagic Design back on board as an AWARD SPONSOR for 2016. We are very grateful to them for their continued support.